We had one of the best apologetics sermon I've ever heard on the resurrection of Christ by Pastor Marvin Wong. Here is the mp3 link. (1) Pastor Marvin said that every sermon in the book of Acts is about the resurrection of Jesus. I shall take his word for it, and will take notice from now on as I read the book of Acts. (2) The resurrection is the linchpin to the gospel of salvation. In the same way a prisoner who has not been released is one who has not fully paid his price of his crime, a Jesus who has not risen, a Jesus who is still dead, will not have fully paid for the price of sin of humankind, for the wages of sin is death. But the good news of Easter is that He is risen! He is risen indeed! The price of sin is fully paid in Christ Jesus and through Him and in Him, we can have life, and life to the fullest. 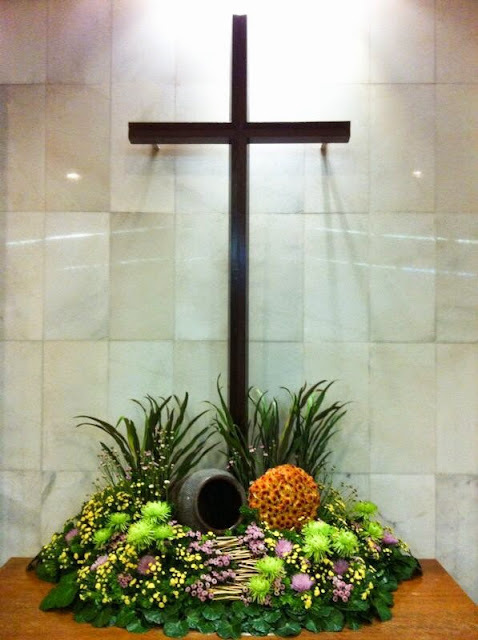 My friend Heng Yew made this floral arrangement in his church, "to the letter" of the gospel - we have the good news of the empty tomb. We proclaim a risen Saviour. Happy Easter everyone! May you also believe in the empty tomb and the risen Lord and have life to the everlasting. Amen. "every sermon in the book of Acts is about the resurrection of Jesus"
The disciples were all about the resurrection. I wonder though, to whom was "price of sin" paid to? Happy Easter from Kansas City! I would say that the "price of sin" is to be paid to God the Father. You think? So God the Son pays God the Father? I understand the theology but really disagree with it because of the way that it paints God as a perpetrator of evil. My thinking is that most of us agree that what the religious and civil leaders did to Jesus was evil. To say that God the Father needed the blood of God the Son is to make the Father complicit in the evil done to the Son. There are many other ways that the cross can be viewed without making God complicit in evil. If you are interested in reading more about them you might want to check out Derek Flood's writings here. Thanks KB - I will read up on it.